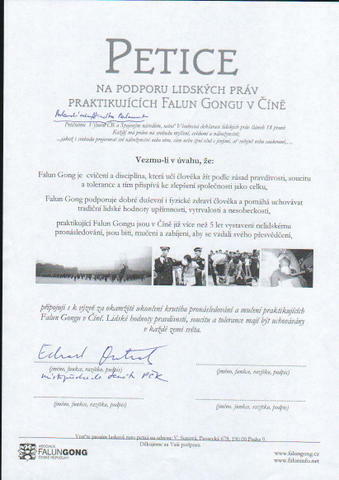 On October 31st, 2005, representatives of the Czech Falun Dafa Association visited Mr Edward Outrata, Vice President of the Czech Senate, regarding the ongoing persecution of Falun Gong. Mr Outrata had previously made the point that the world’s moral pressure on the Chinese government is very important. He also believes this kind of pressure is advantageous to the improvement of China’s human rights situation. Falun Gong practitioners brought up the Chinese government’s slanderous propaganda against Falun Gong. The Vice President said, "The Chinese government has also once tried to defame Christians in front of us, but there was no effect, because we all know Christians very well. The vilification of Falun Gong will also be in vain." I Helped the Police Arrest and Beat Falun Dafa Practitioners at Tiananmen Square. I Now Deeply Repent!